The Medway Valley Walk is an enjoyable valley walk in west Kent between the historic town of Tonbridge and the cathedral city of Rochester. The 45km route is of interest for its landscape and natural history, for its history and archaeology and riverain features. The walk passes through a varied landscape of downland, woodland, orchards and hop gardens; meadows and farmland; lakes and marshland; unspoilt villages and historic towns. Linking all these features is the meandering River Medway. Burham village is 0.5 miles off the route, but has been chosen for its connection to a bus service and for being roughly half way between Maidstone and Rochester. It does, of course, add a mile to the distance. The Medway Valley walk is suitable for family groups, strollers and seasoned ramblers alike. The whole walk, or sections of it, can be achieved with the assistance of public transport. 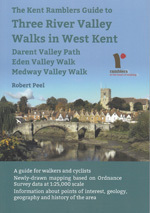 The route is well signposted, waymarked with Medway Valley Walk signs and is shown on Ordnance Survey Explorer maps.